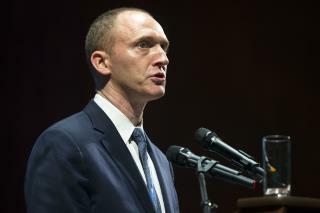 (Newser) – US intelligence officials are investigating a man who may or may not be a foreign policy adviser to Donald Trump and who may or may not be meeting with senior officials in the Russian government, Yahoo News reports. Carter Page—a businessman with a multitude of ties to Russia—was named by Trump as part of his "foreign policy team." That was downgraded by a spokesperson last month to "informal foreign adviser" and again this week to "has no role" in the campaign. Regardless, sources tell Yahoo there's evidence Page has been talking with officials in Moscow about lifting US sanctions on Russia if Trump is elected president. Trump has already disgraced the nation with all his stunts and his criminal family, this is serious and flagrant cavorting with criminals who could do damage to the USA. He and his supporters should be run out of the country. None of them are born with the good sense an American needs to have. Why is it disturbing? I would expect most, if not all, foreign policy experts to actually have some communication ( i.e. , "ties") with people in other countries. The problem is that the US Federal Government foolishly tries to block its Citizens from discussing foreign policy with those in other countries. The more US voices those in other countries hear the better, since they will realize that the US government does not speak for everyone in its borders!